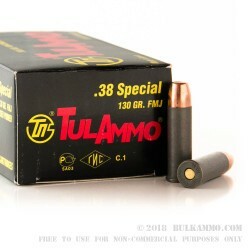 The TULAMMO .38 Special 130 grain rounds are a very cheap alternative to normal shooter rounds for your .38 Special firearms, but they offer a pretty reliable performance and good accuracy and even cleanliness compared to range reloads or remanufactured rounds by mass producers – not to mention their costs are at par or lower than most of those also. One must understand the true benefits of steel cased ammunition and the drawbacks for certain applications so they can extract the best value out of steel cased rounds, especially when they are new to the concept. Thin walled steel tubes are flexible but not particularly resilient. Steel breaks at some point because it is harder than brass, which would prefer to deform or bend. Steel cartridges are not produced with as much attention to detail or time on the production line as brass is. It is therefore not a perfect fit sometimes for certain firearms. Notably, revolvers tend to be on the lower end of the scale for steel, but that doesn’t mean this load can’t be used in revolvers, or that this is a bad cartridge. 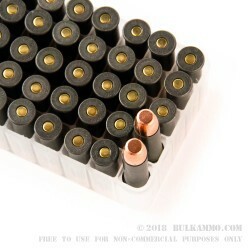 Lever guns, and many revolvers love this Tula Ammunition, but be aware of the needs associated with shooting steel ammunition, and you’ll be laughing all the way to the bank with the money you save.